The hilly capital of Amman is packed with wonderful sightseeing opportunities and fantastic activities for all types of travellers. One favourite route for tourists is the Desert Castle Loop, which spans east and west of the city and has numerous sights to visit on the way and makes for an intriguing day out for the whole family, visiting different castles and exploring the scenic desert landscape. 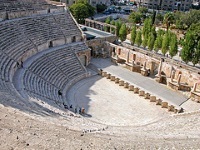 Within the city of Amman there is also plenty to do, including a tour of the spectacular Roman Amphitheatre and a stroll up the Citadel Hill to take in an eagle eye's view of the city. And when your feet are tired, sitting in one of the bustling street cafes is one of the best ways to see what the city is all about. Whether it's talking to people around your or simply watching the routines and traditions of those around you, make sure you find a spot to hang out for an hour and simply enjoy your surroundings. Not far from the city, one can experience many great day excursions from Amman, to sights such as the Jaresh, Madaba and Mount Nebo, each with their own specific cultural significance and each with their own special charm. Also, not to be missed, is the short trip from the capital to the shores of the Dead Sea. Here the northern hills, rich with olive trees, teeter over the rift of the Jordan Valley, which in turn runs down to the Dead Sea, the lowest point on earth. It is a spectacular sight and an experience not to be missed when visiting Amman, something that can truly be appreciated by all visitors to this exciting desert city.